A couple of years ago I wrote a unit test to ensure that all our controller actions (or Controller classes) had appropriate authorisation set up. This ensures we don’t go to production with a new controller or action that falls back to the default authorisation. We must think about this and explicitly apply it. I’ve not thought about that unit test much since then. But this week one of the developers on the team created some new controllers for some new functionality we have, and the unit test failed. Although he’d put an [Authorize] attribute on some of the controllers, he’d not done it for all. A common enough lapse. But thanks to this unit test, it was caught early. You need to specify [AllowAnonymous] or [Authorize] or a derivative on the following actions, or the class that contains them. If you want to use this yourself, you’ll have to edit line 24 (Assembly mvcAssembly = typeof(HomeController).Assembly;) and provide a controller class in your project. It has also been written for NUnit, and we’re using Shouldly as the assertion library. In my previous post I described how to create a throttle with an action block so you wouldn’t have too many tasks running simultaneously. But what if you want to cancel the tasks? In our use case, we have a hard-limit of 2 minutes to complete the work (or as much as possible). A typical run will take about 30-40 seconds. Sometimes due to network issues or database issues we can’t complete everything in that time, so we have to stop what we’re doing and come back later – and hopefully things will be better and we can complete our run. So, we need to tell the ActionBlock to stop processing tasks. To do this we pass it a CancellationToken. When we’ve finished posting work items to the ActionBlock we tell the CancellationTokenSource to cancel after a set time. We also check the cancellation token from within our task for the cancelled state an exit at appropriately safe points. // After posting the work items, set the timeout in ms. If you start your timer (When you set cts.CancelAfter(...)) before you’ve posted your work items, it is possible for the cancellation to trigger before you’ve posted all your work items, in which case you should check the cancellation token as you’re posting your work items, otherwise you will be wasting time posting work items that will never be processed. We have an application that needs to perform a repetitive task on many external services and record then aggregate the results. As the system has grown the number of external systems has increased which causes some issues as we originally just created a number of tasks and waited on them all completing. This overwhelmed various things as all these tasks were launched near simultaneously. We needed a way to throttle each task, so we used an ActionBlock, part of the Task Parallel Library’s System.Threading.Tasks.Dataflow package. This is the very basic application that I’ll be parallelising. Here is the same program, but with the work wrapped in an ActionBlock. It is a bit more complex, and currently for little extra benefit as we’re not done anything to parallelise it yet. // Create the work set. // Wait for the work to complete. This does the same as the first version, by default an ActionBlock does not parallelise any of the processing of the work. All the work is still processed sequentially. I said before this is for “little extra benefit”. So I should explain what I mean by that. There is now some parallelisation between the producer and the consumer portions. The for loop that contains the throttle.Post(...) (the producer) is running in parallel with the calls to DoStuff() (the consumer). You can see this if you slow down the producer and introduce some Console.WriteLine(...) statements to see things in action. This is some example output from that version of the code. 000 : Posting Work Item 0. 001 : Posting Work Item 1. 002 : Posting Work Item 2. 003 : Posting Work Item 3. 004 : Posting Work Item 4. 005 : Posting Work Item 5. 006 : Posting Work Item 6. 007 : Posting Work Item 7. 008 : Posting Work Item 8. 009 : Posting Work Item 9. I slowed the producer by introducing a wait of 50ms between posting items. As you can see in the time it took to post 10 items (it is zero based) it had only processed 6 items, but the producer and consumer are running simultaneously, so it is not waiting until the producer has completed before it starts processing the items. Finally, we get to the point that we can set some sort of throttle. In our use case we had a lot of work to do, most of which was actually waiting for external systems to respond, but if we threw everything in at once it would be overwhelmed. In our example, we’re just going to set it to 3 for demonstration purposes, but you’ll likely want to experiment to see where you get the best results. 010 : Posting Work Item 10. You can see at the start the number of simultaneously running tasks builds up to the MaxDegreeOfParallelism value that was set. So long as the producer part is producing work items faster than the consumer can consume them, the tasks in progress (TIP) will stay at or close to the MaxDegreeOfParallelism. I’ve mentioned a bit about the attributing the handler and the step and timing parameters, but I’ve not explained them properly in previous posts (“Retrying commands” mentions steps, and “Don’t Repeat Yourself” also mentions timings). So, I’ve created a small project to demonstrate what they mean and how it all operates. If you just have the target handler, that is the handler that is directly tied to the Command that got Sent, without any decorations, then we won’t have to worry about the Russian Doll Model. There is only one handler, and it goes directly there. However, as soon as you start decorating your handler with other handlers it comes in to effect. As the name suggests this affects when the decorated handler will run. 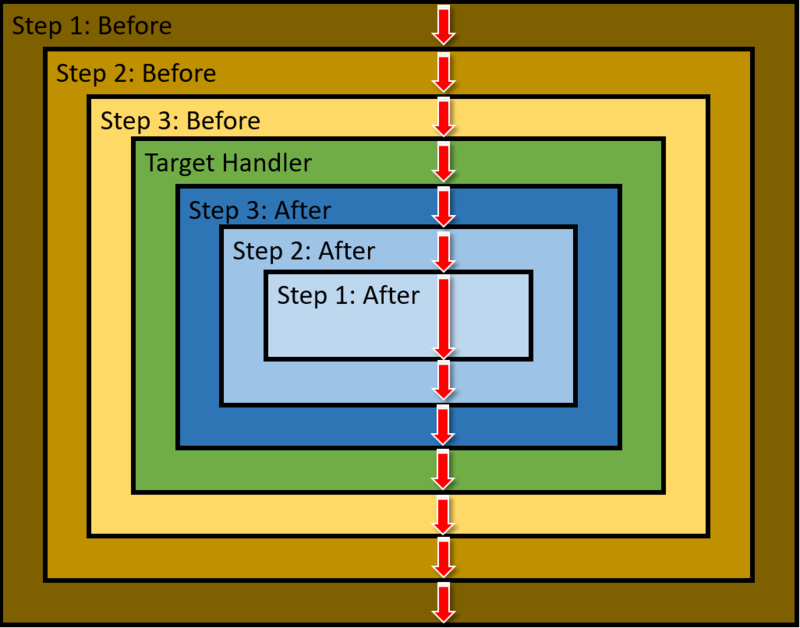 Either before or after the target handler. However, handlers set to run “before” also get an opportunity to do things afterwards as well due to the Russian Doll model, as we’ll see. Obviously, you do not have to call the base.Handler from your handler, but if you do that you break the Russian Doll Model, subsequent steps will not be called. Throwing an exception also will not call subsequent steps. According to Ian Cooper, the originator of the Paramore Brighter framework, “An exception is the preferred mechanism to exit a pipeline”. If you have multiple decorators with the same timing, it may be important to let the framework know in which order to run them. For Before handlers the steps ascend, so step 1, followed by step 2, followed by step 3, etc. For After handlers the steps descend, so step 3, followed by step 2, followed by step 1. You can, of course, create a class between RequestHandler and your own target handler class and this adds its own complexity to the model. Any handler attributes added to the base class will be added to the pipeline and those handlers will be run for the time, and step they specify. Also, remember that the base class has its own Handle method which can have code before and and after the call to the base class’s implementation. This can be seen in the sample project on GitHub, which you can download and experiment with to see how the code is executed. You may wish to add similar functionality to many (or all) command handlers. The typical example is logging. You can decorate a command handler in a similar way to the policies I showed in previous posts to add common functionality. I’ve used this technique to guard the handler from invalid command arguments/parameters (essentially a validator), and for ensuring that we ping our APM (Application Performance Management) tool when a command completes. I’ll use the latter to demonstrate creating a custom decorator and handler to initiate this common code. Paramore Brighter Command Processor will look for any attributes derived from RequestHandlerAttribute that are added to the Handle method on your command handler class. It will then use them to build a pipeline for your command. We are deriving from RequestHandlerAttribute, and it has an abstract method that you need to implement. GetHandlerType() returns the type of handler that needs to be instantiated to handle the common task. The RequestHandlerAttribute class also takes two arguments for its constructor that you either need to capture from users of your attribute or supply yourself. It takes a step and a timing parameter. Since we’ve already talked about step in a previous post we’ll move on to talking about timing. The two options for timing are Before and After. In the previous examples the timing has been implicitly set to Before because the handler needed perform actions before your target handler (the one that you decorated). If you set the timing to After it only actions after your target handler. In the example here, the timing is set After because we want to make sure that the the handler completed correctly before our handler runs. So, if it throws an exception then our heartbeat handler won’t run. If you need to perform an action before and after, then set the timing to Before, and perform actions before the call to base.Handle() and after the call. // We would probably call a heartbeat service at this point. // But for demonstration we'll just write to the console. The important thing, as will all handlers, is to remember the call to the base.Handle() which ensures the pipeline is continued. // Stuff to handle the command. The first two decorators are from previous posts (Retrying Commands and Implementing a fallback exception handler) while the third is our new decorator. When run, you can see that if the service fails completely (i.e. all the retries failed) then the Heartbeat does not get run. However, if the command succeeds then the heartbeat handler is run. Our APM knows the command succeeded and can display that. Paramore Brighter supports Policies to maintain quality of service. This is useful when your command makes calls to external services, whether they are databases, web services, or any other end point that exists out of the process of your application. You can set up retry policies, circuit-breaker policies, and timeout policies. For this post, we’ll concentrate on setting up a retry policy. The full code from this post is available on GitHub.com. The SalutationHandler that we’ve been using in previous posts now emulates an external failure by throwing an exception in some cases. The policy handler will catch the exception and act on it, retrying the command if necessary. First off let’s set up the policy. In this case I’m going for an exponential backoff (doubling the wait time on each attempt) and it will perform a maximum of 4 attempts. // These are the default policies that must exist. The policies are defined using Polly, a .NET resilience and transient-fault-handling library. The .Handle<Exception>() means the policy handles all exceptions. You might want it to be more specific for your use case. e.g. SqlException for database errors. The WaitAndRetry(...) takes a set of timings (as TimeSpan objects) for how long to wait between attempts and an Action which is run between attempts. Although there are only 3 times here, it will make 4 attempts. Each time represents the amount of time after an attempt before retrying. The first attempt is performed immediately. The Action allows you to set up what you want to do between attempts. In this case, I’ve only had it output to the console. You may wish to log the error, or take other actions that might help it work. Finally, we add the policy to the registry and give it a name, so we can refer to it on our Handle method in our command handler class. In order for Brighter to be able to use this policy, the Handler for it needs to be registered in the IoC container. It should be noted that the regardless of the number retries that are made, they are all processed through the same instance of the command handler. This may be important if you store state to do with the progress of the command. It also might be important in case any services you rely on that are injected into the command handler get left in an undefined state if things go wrong. We still have our fallback that we set up in the previous post on Paramore Brighter, but we now have a UsePolicy attribute. And since we have two attributes the Step argument now becomes important. The command processor sets up the policy and command handlers like a Russian doll, with the command handler right in the middle. 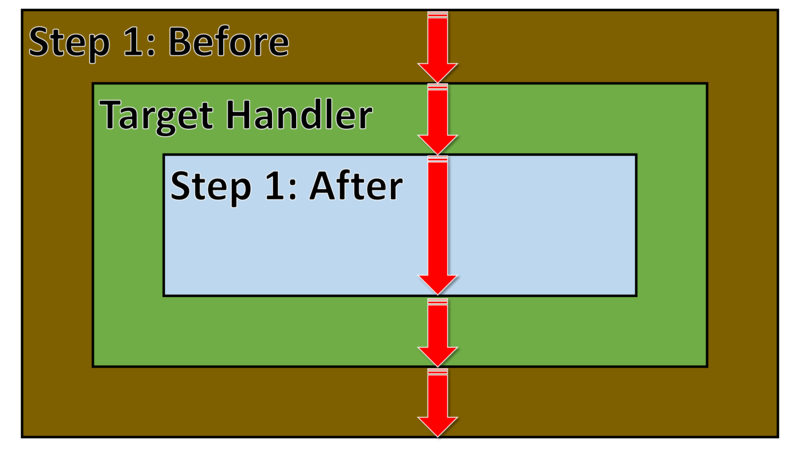 The outer handler (doll) is step 1, then the one inside that is step 2, and so on until you get to the actual command handler. So, in this case at the very outside is the FallbackPolicy and it only does its thing if it gets an exception, the UsePolicy will act on exceptions before the fallback sees them most of the time. The UsePolicy attribute takes the name of the policy that we set up earlier when we were creating the policy registry. So, when we ask to greet “Voldemort” it will always fail. We get a stack trace that shows off the Russian Doll quite well. System.ApplicationException: A death-eater has appeared. The above is our SaulatationHandler, starting from the top where the exception is thrown, until the point that our code is called by Paramore Brighter itself. The above section is all part of the retry handler, as defined by the policy we set up. Most of this code is in Polly, which is the quality of service package that Brighter uses. // stack trace, but I wanted to show you where it came from. Finally, the most outer of the handlers (which you cannot normally see all of because it has caught the exception in CatchAll) before handing it off to our fallback handler. Recently I needed to set some file permissions on a remote machine. Previously I’d done this relatively easily through a share as the user account I was using also had administrator rights on the other side and I was dealing with domain accounts. However, this did not work for a user that was local to the remote machine. To run the PowerShell remotely, first of all, I create a new PowerShell session on the remote machine with New-PSSession, then I run a script in that session with Invoke-Command, and finally I clean up with Remove-PSSession to end the remote session. Bear in mind that you will need the appropriate permissions on the remote machine for whatever actions you want to take. This is where all the work is done. You can pass a session to Invoke-Command, and you can also pass an ArgumentList to pass in to the command. This gives it some fantastic abilities. Be aware that variables that exist outside the script block are not visible within the script block, you have to pass them as an ArgumentList (alias Args), and the script block has to pick them up. Hence the code above starts the script block with a params section in order to pick up the values passed as the Args. In order to add new rules to an ACL you have to Get-Acl to get the existing set of rules, create the new FileSystemAccessRule for the permission you want to grant, then AddAccessRule to the ACL you retrieved, and finally Set-Acl to persist the addition. If you were just to create the new rule and set that, then all the existing rules would be replaced with the one rule that was just created. If you are using the IIS Administration ReST API to manage IIS, one thing that is not immediately obvious is that if you put your websites outside of %systemdrive%\inetpub you won’t be able to access them through the API. e.g. You won’t be able to set the physical path of a website to a location outwith %systemdrive%\inetpub. So, you need to update its settings file (in my case, located at C:\Program Files\IIS Administration\2.2.0\Microsoft.IIS.Administration\config\appsettings.json) to include a files section. The files section is at the same level as security, logging, cors, etc. 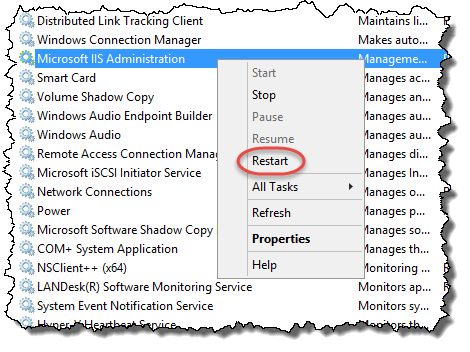 Remember to restart the “Microsoft IIS Administration” Service after making changes to the appsettings.json file so that it will be picked up. 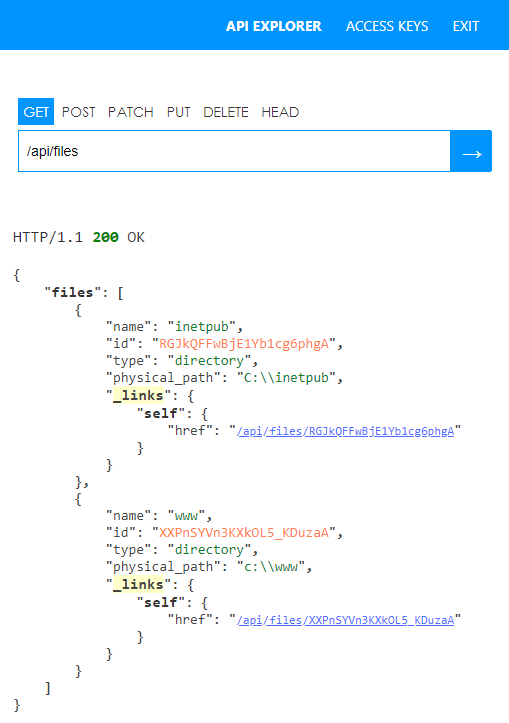 You can also check which files IIS Administration has access to through the API. The end-point is /api/files/ and, if there are no files set up it will show an empty JSON array for the files part of the result. 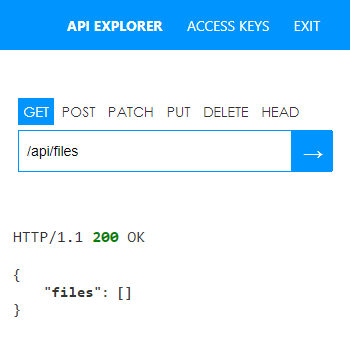 Once the files section is added to the appsettings.json file and the Microsoft IIS Administration service is restarted, the API will show which files the API can access. Finally, if you are having difficulty saving the appsettings.json file, read how to take ownership of a file in order to be able to be able to write to it. Updated 14/March/2018: Note to restart the Windows Service; Show what files are available through the API; formatting.